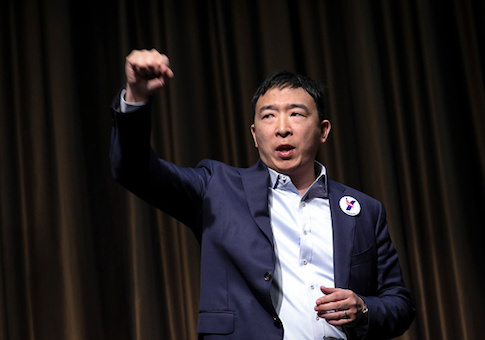 BOSTON—Before Andrew Yang took the stage Wednesday evening, a peppy campaign spokeswoman taught the 200-or-so supporters assembled on Boston Common a new cheer. "Andrew says a lot of things about numbers," she explained. "He's really into the facts, which is very exciting. So when he says things like ‘when you look at the numbers,' I want you to put your ‘math' signs in the air. If I say ‘math,' you say—"
"Math!" the crowd screams back. Many of their bright-blue campaign signs also say "Math." A few, customized for the event, are emblazoned with "Welcome to Math-achusetts." Every time Yang mentions a statistic during his 20-minute stump speech, he is cut off by the enthusiastic chants of "math" from the eager-to-please crowd. Here, then, is some math for you: according to the most recent Morning Consult Poll, about 1 percent of Democratic primary voters are currently backing him, on par with such notables as Rep. Tim Ryan and Gov. Steve Bullock. Fifty-nine percent of respondents have never heard of the entrepreneur turned candidate; just 13 percent view him favorably, compared to 8 percent unfavorably. But unlike such better-known presidential contenders as Gov. Jay Inslee (52 percent have never heard of) and Rep. John Delaney (46 percent), Yang has developed a small but devoted following. Together, they have propelled him over the 65,000-donor threshold required to make it to the debate stage in June. Much of this momentum has come online: as Yang put it Wednesday, "I have a very internet candidacy." Many heard about him through podcast appearances; Boston natives Danny and John heard Yang on The Breakfast Club, and say they support him because he promises "radical change" and "feels human." A businessman-turned-candidate seems to them like he could have a real impact, unlike all of the elected politicians in the Democratic field. To be sure, Yang's path to politics is different from Donald Trump's. Yang began his entrepreneurial life running a successful education firm, worked his way through the start-up world, and then founded Venture for America, a fellowship that sends recent college grads to start businesses in middle-American cities like Cleveland or Detroit. This work led him to political influence, including recognition by the Obama White House. That, along with Trump's election, got him thinking bigger, specifically about the threat that automation—AI, robot workers, driverless cars, etc.—poses to American stability. "He's talking about automation really," Joe from Connecticut told the Washington Free Beacon. "Everyone else is talking about things that aren't really applicable. He's the one that's talking about the future, not really these past issues." During his speech, Yang rattles off a wave of statistics ("math!") about the future of automation. The median retail worker is a 39-year-old woman; the median truck-driver is a 49-year-old man; 30 percent of malls will vanish within the next three years; trucking will be mostly automated within five to 10. The timing of modern automation and its effects on employment and the economy is something about which economists disagree. There is good reason to believe that robots reduce employment and will eventually replace lots of workers. But it is also possible that advancing technology will create new job-market opportunities. A lot depends on the form of automation and how it is rolled out. In Yang's view the negative effects of automation are already here. He says Trump's 2016 victory was caused by the automating away of four million manufacturing jobs in key swing states like Pennsylvania and Wisconsin. This shift, Yang predicted, is just the beginning of mass technological unemployment. "We're in the third inning of the greatest economic and technological transformation in the history of our country," he explained. "The first inning was the deregulation of financial services. The second inning was the decimation of manufacturing work. The third inning, which we're in the middle of, is the obsolescence of brick and mortar retail. The fourth inning will be autonomous cars and trucks. The fifth inning will be AI doing the work of not just call center workers but book keepers, and accountants and lawyers." The result could be mass chaos. Yang described a recent strike in Indiana, where truckers convoyed up and drove their vehicles well below the speed limit on the highway, gumming up traffic in protest of new electronic logging devices. "These dozens of truckers were protesting electronic monitoring of their driving," Yang said. "How do you think they're going to respond to a robot truck that never stops and is going to take their job? It's going to get really, really gruesome." The solution to the problem of automation, in Yang's telling, is to buy peace through redistribution. A Universal Basic Income (what Yang calls the "Freedom Dividend") would give $1,000 a month to every American 18 to 64, regardless of income. Add to this Medicare-for-All and a suite of other proposals meant to create what Yang calls "human-centered capitalism." More radical proposals—such as a social credit system and mass amnesty—did not make the cut for his speech. One local graduate student, Dan, explained how his support for Yang is driven by a willingness to talk about the threat Dan's own work in automation poses. "I work in computation neuroscience, and we're using machine learning to analyze data—like big, big data—we're using it to automate away jobs that we'd normally hire a technician to do by hand," he said. "A year ago, we automated away a large part of what someone was doing. And I think things like that should be addressed by policy. And [Yang is] the only candidate that appears to have anything around automation." Dan appears to be the rule, rather than the exception, for who composes the crowd. When Yang asks how many there are entrepreneurs or work in tech, a big cheer goes up. Later, when he asks how many know a trucker—he does not ask if anyone actually is a trucker—the response is much more subdued. When he polls the crowd for former Trump supporters, a single person raises his hand. Based on Wednesday's attendees, Yang supporters are the people who will do the automating away of jobs, rather than have their jobs automated. They are students of, or have degrees in, engineering and computer science. They want legalized weed, but would never be arrested for smoking (several people in fact shared a joint during the event). They are, in short, the sort of person who would show up to a rally and chant "math" at their candidate of choice. Although his income proposal is universal, Yang's appeal appears to not be: #YangGang members do not look like the people the robots will be replacing. But one is left with the sense that Yang prefers the adulation of a small crowd over the votes of a bigger one. "Andrew Yang! Andrew Yang!" the crowd yells at the end of the speech. "Chant my name! Chant my name!" Yang responds, grinning from ear to ear. This entry was posted in Politics and tagged 2020 Election, Andrew Yang. Bookmark the permalink.